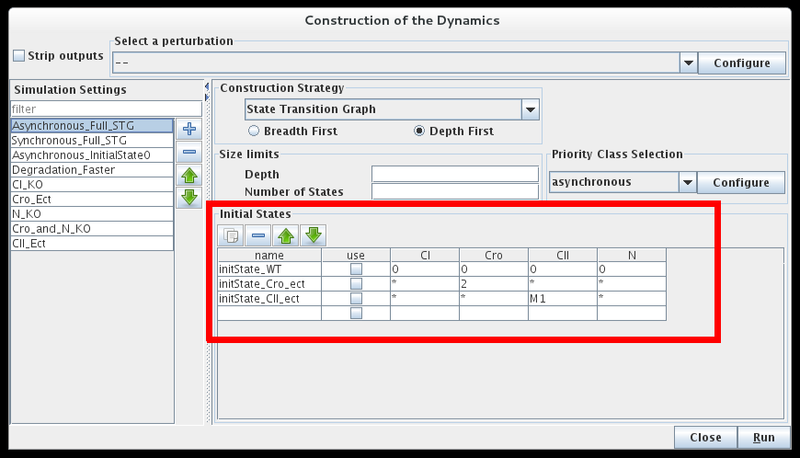 Named groups of states can be defined for the regulatory graph and used for example as starting point for the simulation. Each line in the table of intial states has a name and provides a value or a range for one or more components. Components which are not restricted are denoted by stars ("*") in the table. Each row of the table corresponds to a set of states, where activity levels are specified for each component in the corresponding table cell. Each component can use all of its possible levels (denoted by a star ("*")), a single level or any subset of levels, separated by semicolons (;). Intervals can also be defined using a dash ("0-2" denotes all levels from 0 to 2, included). The special value "m" denotes the maximal level of the component. For example, "0;2-4" means "0 or values between 2 and 4" and is identical to "0;2;3;4". "1-m" means "any activity (from 1 to the max)". The default, denoted by a "*", covers all possible values (it is thus the same as "0-m"). Initial states can be reordered, deleted and duplicated using the buttons on top of the table. A value can be entered in many cells at once using multiple selection.